We see a lot of bank houses (literally houses built into a bank) in the more rural areas that we serve around the Welsh Marches and Shropshire, etc. Traditionally, if the walls have been tanked, it is usually with a render, possibly with some kind of waterproofer mixed in or perhaps a slurry of some type. When we get called in it is usually because this has failed at some point in the past and the building has become very damp or possibly even flooded - this is the usual scenario we see. When renovating a bank house, and we can't stress this strongly enough, get the tanking right! Otherwise it can be a constant and expensive problem throughout the life of the building. When everything is stripped back it can be a relatively straightforward process but retrofitting later can potentially be much more complicated and time consuming... In scenarios where tanking is being considered we constantly hear people say, "it's bone dry"... It hardly ever is, and even if it was at that moment in time we still wouldn't trust it to remain so below ground. Our advice is very simply, never cover anything in an old building, especially underground, without first checking it with a damp meter. They are very cheap now and simple to use. Without meaning to preach this could save you a lot of pain later on! 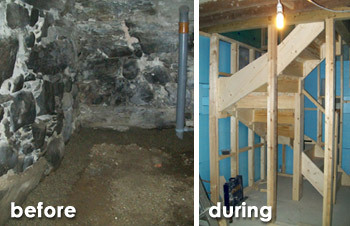 A 'from scratch' renovation presents an ideal opportunity to really show the power of a well installed cavity drain system! A bank house may be treated like a basement conversion in terms of structural waterproofing but with the advantage that at least one side of the property will be at, or above, ground level. One great benefit here is that, unlike an average cellar cavity drain system, no mechanical pump will normally be required and you can rely on good old 'no moving parts' gravity to ship the water out to a soak-away, drain, watercourse or similar. There are several ways you can achieve this but here is one way that we have devised for some of our customers. 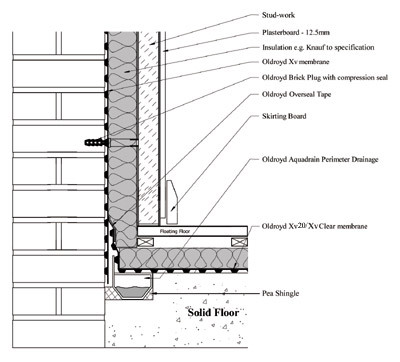 This is perfect where a new concrete slab is planned but may still be feasible with modifications if the current slab is to be retained - you may need advice from an engineer if the slab has to be cut as this may affect the stability of the wall in some cases. The beauty of this system is that once the cavity drain membrane is correctly installed to the wall you can create the rest of the system from standard and relatively cheap materials from your local builder's merchant. For example, the membrane (shown in blue in the image) sandwiching the insulation and wrapping up to the cavity drain membrane can be standard Visqeen or similar and the land-drain pipe can be 80mm, 100mm or even 150mm; all 'off the shelf' items. The other advantage with using standard land drainage techniques is that they carry far greater volume than the basement Aquadrain Channels (ideal if your house is built into the side of a Snowdonian!) and they can easily tap into a standard drain set-up as required. Brick and block-work will normally be suitable for the direct installation of a cavity drainage membrane, obviously assuming that any serious structural defects will be addressed prior to installation, but stone may need a little 'TLC' first. If your wall is constructed of random stone, in an unfinished state, it may be wise to render the wall first. This will benefit the building twofold. Firstly, it will add to the structural stability of the wall - random stone walls, when cleaned back to the stone blocks can be prone to crumbling and even small pieces coming away behind the membrane can cause problems. Secondly, a good, strong render (even a scratch coat) will provide far superior anchoring for the self-sealing brick plugs that are used to fix the membranes in place. Where there is a perfectly serviceable floor slab already in place, the bank house can, once again, be treated like a basement and channels may be cut into the slab (again advice from an engineer is recommended). 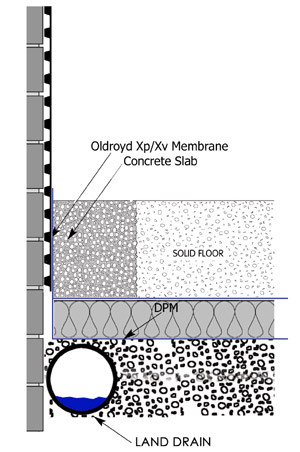 The chief difference between these two scenarios is that in this instance the floor slab is covered with a cavity drain membrane, such as Oldroyd Xv Clear for example or possibly Oldroyd Xv20 Black if the slab is uneven (Xv20 creates more space under the membrane for greater water dispersal), and it is therefore deemed to be a wet slab. Your entire room, or rooms, will be contained within the membranes and then internal construction of standard studwalls, insulation, plasterboards, etc. can begin inside the protected area. Firstly, it may be worth including rodding eyes in the aquadrain channel system in case they get blocked over time and need to be jetted through. For information about other forms of damp proofing that may assist you with your renovation/conversion work please see our damp proofing section.